The Star System from Huntington Beach, Calif.-based Blue-White Industries features the Chem-Feed C-1500N injector of your choice—standard, deluxe or micro-feed. 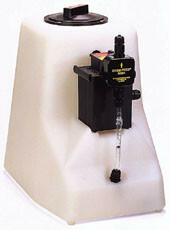 The injector is mounted on a sturdy polyethylene tank—7-, 15- or 30-gallon capacity sizes available. The tank has extra heavy wall thickness for extra strength and is rectangular in shape for easy placement. An opening at the top makes adding chemicals simple. The multi-position opening can be left open, closed or vented.